"Weisman here gives a solid outline of the history of Jewish divisiveness that anyone can follow, an important beginning to understanding the truth over myth about Judaism in American history." 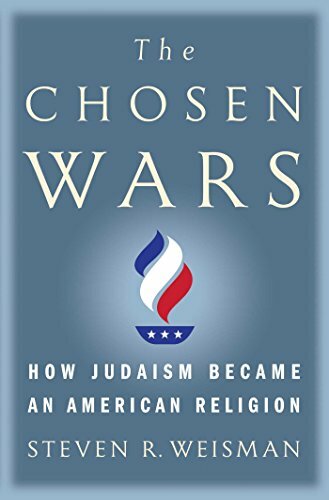 Author Steven R. Weisman begins The Chosen Wars with the first ordination of rabbis on American soil, on July 11, 1883. Persons from across the country believed that Judaism "was marking another significant step in the arrival of American Jews as equal to Christians in the Gilded Age." It actually "marked another step toward the unraveling of Jewish unity in the United States." The resulting offensive dinner to kosher standards marked a beginning of the great division of American Judaism "into disputing (and disputatious) factions" that two years later "coalesced into Reform, Conservative, and Orthodox Judaism," "a singularly American phenomenon." The first Jews arrived in America in 1654 as victims of the Spanish Inquisition and expulsion from Brazil. Their first division began with differences between Jewish the Ashkenazi and Sephardic traditions, followers of each regarding the other "as abrasive and uncouth." These "adherents of a unique religious faith" "wished or needed to adjust and even disregard Jewish practices and doctrines." As America changed, they did to from "being treated as equal citizens" to "participating in services as families." The growth of their reforms paralleled change in the Christian faiths and even the Muslims in America. Weisman writes that the American Jews had to "establish roots in places that lacked kosher butchers or effective means to carry out other dietary restrictions." Issues of the Civil War, evolution, a Jewish self-government, playing the organ in services, reading the Torah, status as God's Chosen people, the Torah as literal history or only moral example, Christian missionaries, and slavery fractured the Jewish community. The reformers saw themselves "in the solid tradition of Jewish intellectuals and sages" and "in response to contemporary demands and sensibilities." "The division of Jews into different camps was an old story, going back at least to the time when the Babylonians destroyed the First Temple." European Jews "were accomplished in medicine, the arts, and physical science" as well as "the evolving concepts of science, citizenship, anthropology, history, and literary analysis in an egalitarian democracy." Their American transplants continued the same secular attitudes. Some Jews "relegated to the sidelines the requirement to carry out hundreds of practices in clothing, diet, work, and prayer." Success came in part, because "there were no rabbis in America until the 1840s." "No single synagogue or organization could claim that it alone represented Jews." "Some 15% of the colonial Jews" intermarried with Christians. "Jews of all sorts lined the fray—rabbis, intellectuals, businessmen, educator, civic leaders, and congregants themselves." They numbered only some 250,000 members in 1880. The Jews who followed, but particularly the 2,000,000 who from came Eastern Europe and Russia, "inherited and largely accepted Americanized Judaism." Even the earliest Jews in America fought prejudice, however. Their "forced acceptance" "helped open the boundaries of tolerance for others, including Quakers, Lutherans, and Catholics," as well as African Americans in modern times. The Jews greatest asset came from their "capabilities at business and trade" that required "adjusting to lifestyle and business realities." They also became victims of anti-Semitism fueled by prejudice against immigrants, and they became scapegoats for the brutal capitalism practiced by members of all faiths. The subject does not involve a large number of individuals. Weisman mentions in particular the first Jewish community, in what became New York, and the Charleston, South Carolina, community. Since the 2016 presidential election, public expressions of anti-Semitism are on the rise in the United States. Weisman here gives a solid outline of the history of Jewish divisiveness that anyone can follow, an important beginning to understanding the truth over myth about Judaism in American history. The author also writes in a fast paced, clear prose that tells and teaches much but in a casual read. Chosen Wars includes a useful timeline, glossary, bibliography, and recommended reading.